We are excited to announce that several chapters of AVATAR have started up in the past few months, and the website has been updated to reflect these changes. 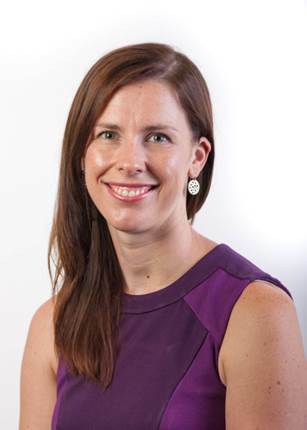 The Paediatrics chapter head is Tricia Kleidon, a Nurse Practitioner in paediatric vascular access based at the Lady Cilento Children's Hospital in Brisbane. Tricia has a wealth of experience and knowledge about vascular access device insertion and maintenance in children and is keen to collaborate with other nurses interested in this area. In Queensland, we have two highly experienced nurses sharing the chapter lead position. Both Nicole Gavin and Julie Flynn are cancer nurses in the process of completing their PhDs in vascular access. Leading the New South Wales chapter is Dr Evan Alexandrou, RN PhD, a Clinical Nurse Consultant Vascular Access at Liverpool Hospital and Senior Lecturer at Western Sydney University. The Western Australia chapter is led by Peter Carr, an Emergency Department nurse at Fiona Stanley Hospital in Perth and a Lecturer at the University of Western Australia. Peter is currently completing his PhD in vascular access. We welcome our colleagues, Dr Rebecca Sharp, RN PhD, and Prof Adrian Esterman, who will be leading the South Australian chapter of AVATAR. Rebecca has a longstanding record in vascular access research and is currently a lecturer in the School of Nursing and Midwifery at the University of South Australia. Adrian is a highly respected epidemiologist and biostatistician at the University of South Australia with over 40 years of experience and more than 250 publications. The role of the Chapters is to promote vascular access research and evidence uptake in their respective areas (e.g. State clinical practice guideline updates), and to provide a local 'friendly face' for AVATAR for clinicians and researchers who are interested in getting involved. Each year, the Chapters will organise local educational seminars to promote and network the local vascular access researchers with clinicians and visiting speakers. These seminars will be held in partnership with AVAS and other professional organisations. The AVATAR Group specializes in research to prevent intravascular (IV) complications. If you know of anyone who would like to participate in this survey, please forward these details. Improving the experience for cancer patients undergoing treatments such as chemotherapy or a blood transfusion is the focus of new AVATAR research which has received $1.1m in National Health and Medical Research Council (NHMRC) funding. Success rates for this funding are around 14%, so this is an impressive achievement. Current PICC dressing and securement products are not preventing the 30% of PICCs that develop infection, occlusion, thrombosis or dislodgement, therefore this trial will aim to reduce the incidence of PICC failure and test new approaches for their effectiveness, costs, comfort and practicality. Run in collaboration with the Royal Brisbane and Women's, Princess Alexandra, and Lady Cilento Children's Hospitals and other universities around Australia and the US, the nursing-led study is multi-centre and will compare four types of dressing and securement combinations: a combination separate securement device plus standard dressing, versus an 'all in one' securement dressing, and a chlorhexidine antiseptic sponge versus plain dressing alone. The effectiveness and cost-effectiveness of these treatments will be tested and it is hypothetised that the new approaches can prevent half of all Catheter Associated Bloodstream Infections, and one quarter of all PICC failures. The Australian Vascular Access Society (AVAS) is an association of healthcare professionals founded to promote the vascular access specialty. The Society partners with vascular access researchers across the globe to develop evidence-based innovations in vascular access. Today, its multidisciplinary membership advances research, professional and public education to shape practice and enhance patient outcomes. The electronic journal Vascular Access was founded as the official publication of AVAS, as a venue for national and international scholars and practitioners to publish high-quality peer-reviewed research and educational reviews relevant to vascular access in Australia and globally. The journal also seeks to provide a space for evidence-based discussions and debate on issues of importance to patients requiring vascular access. Vascular Access is published twice a year (April and October) and manuscripts pertaining to this specialty are invited. The editor welcomes manuscripts in the form of research findings, clinical papers, case studies, reports, review articles, letters and product appraisals. Submissions will be accepted from any country but must be in English. Please adhere to the attached Author Guidelines when preparing your submission. In Dr. Pettit's honor, AVA and the Pediatric Special Interest Group recognize her scholarly excellence and contributions to the art and science of vascular access and bestows the title of the Janet Pettit Scholar 2016 on Ms. Amanda Ullman. Ms. Ullman is an internationally-recognized researcher and outstanding pediatric clinician and colleague. Her practice-changing work focuses on prevention of complications in the pediatric vascular access domain. With her numerous publications, she has richly contributed to the science and practice of vascular access and impacted care for children globally. As a Director of the Alliance for Vascular Access Teaching and Research Group, she is well-regarded as an exceptional collaborator and impactful leader. In Australia, she developed a unique network bringing academics and clinicians together for an evidence-based pediatric vascular access program. While Ms. Ullman is currently completing her Doctor of Philosophy, she continues to dedicate her time, talent and passion to mentoring other clinicians worldwide to advance the knowledge for evidence-based practice in pediatric vascular access. RBWH 2016 Research Project Grants awarded to Prof Joan Webster and team for her project titled: Biopatch or Kendall AMD foam disc to reduce the incidence of central-line-associated blood stream infection: A randomized controlled trial. Nicole Marsh: Identifying potential risk factors thath predict peripheral intravenous catheter failure. Elise O'Dell- Button: Clinical indicators that identify risk of deteriorating and dying in people with a haematological malignancy. Nicole Gavin: The safety of parental nutrition regarding microbial growth and vascular catheter-related infection (the FACT study). Julie Flynn: Evaluating current and new methods for effective decontamination of nedleless connectors: A pilot randomised control trial. They wish to thank the Royal Brisbane and Women's Hospital and RBWH Foundation for their contribution and generosity in helping to "Make vascular access complications history"! 1. Gavin NC, Webster J, Chan, RJ, Rickard CM. Frequency of dressing changes for central venous access devices on catheter-related infections. Cochrane Database of Systematic Reviews 2016. Issue 2. Art. No. : CD009213. DOI: 10.1002/14651858. We reviewed the available evidence about the effect of different time intervals between dressing changes for CVADs and whether they had an effect on the risk of CRBSI and other complications. We found five studies that provided information for our review. 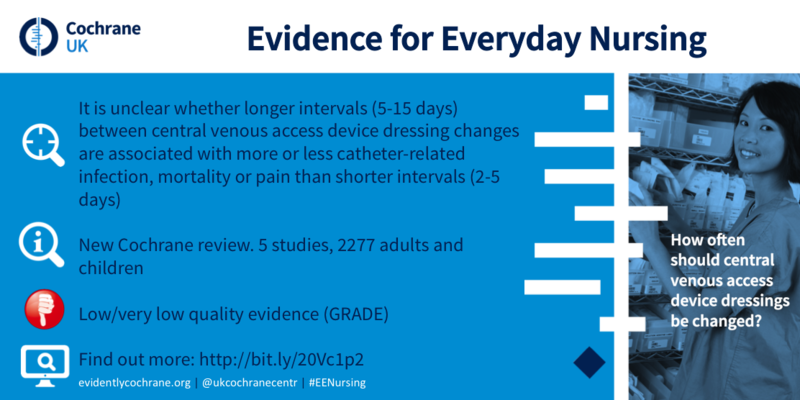 The best available evidence is currently inconclusive regarding whether longer intervals between CVAD dressing changes are associated with more or less catheter-related infection, mortality or pain than shorter intervals. 2. Choudhury MA, Marsh N, Banu S, Paterson DL, Rickard CM, McMillan D. Molecular comparison of bacterial communities on peripheral intravenous catheters and matched skin swabs. PloS One. 2016: 11(1) e0146354. This study aimed to determine the bacterial community structures on skin at PIVC insertion sites and to compare the diversity with associated PIVCs. Diverse bacterial communities were observed at skin sites despite skin decolonization at PIVC insertion. The positive association of skin and PIVC tip communities provides further evidence that skin is a major source of PIVC colonisation via bacterial migration but microbes present may be different to those traditionally identified via culture methods. The results provide new insights into the colonisation of catheters and potential pathogenesis of bacteria associated with CRBSI, and may assist in developing new strategies designed to reduce the risk of CRBSI. 3. Bugden S, Shean K, Scott M, Fraser JF, Mihala G, Clark S, Johnstone C, Rickard CM. Skin glue reduces the failure rate of emergency department inserted peripheral intravenous catheters: A randomized controlled trial. Annals of Emergency Medicine. 2015. Early on-line. Peripheral intravenous catheters are the most common invasive device in health care yet have very high failure rates. We investigated whether the failure rate could be reduced by the addition of skin glue to standard peripheral intravenous catheter care. Methods: We conducted a single-site, 2-arm, nonblinded, randomized, controlled trial of 380 peripheral intravenous catheters inserted into 360 adult patients. The standard care group received standard securement. The skin glue group received standard securement plus cyanoacrylate skin glue applied to the skin insertion site. The primary outcome was peripheral intravenous catheter failure at 48 hours, regardless of cause. Secondary outcomes were the individual modes of peripheral intravenous catheter failure: infection, phlebitis, occlusion, or dislodgement. Results: Peripheral intravenous catheter failure was 10% lower (95% confidence interval 18% to 2%; P=02) with skin glue (17%) than standard care (27%), and dislodgement was 7% lower (95% confidence interval 13% to 0%; P=04). Phlebitis and occlusion were less with skin glue but were not statistically significant. There were no infections. Conclusion: This study supports the use of skin glue in addition to standard care to reduce peripheral intravenous catheter failure rates for adult emergency department patients admitted to the hospital. 4. Carr, P, Rippey J, Budgeon C, Higgins NS, Cooke ML, Rickard CM. Insertion of peripheral intravenous cannulae in the Emergency Department: Factors associated with first-time insertion success. Journal of Vascular Access. ePublished, Dec 2015. We sought to identify the reasons for peripheral intravenous cannulae (PIVC) insertion in the emergency department (ED), and the first-time insertion success rate, along with patient and clinician factors influencing this phenomenon. Methods: A prospective cohort study of patients requiring PIVC insertion in a tertiary ED. A total 734 PIVC insertions were included in the study where 460 insertions were analysed. The first-time insertion success incidence was 86%. The antecubital fossa (ACF) site accounted for over 50% of insertions. Multivariate logistic regression modelling to predict first-time insertion success for patient factors found: age <40 versus 80+ years, emaciated versus normal patient size, having a visible or palpable vein/s, and ACF versus forearm insertion site to be statistically significant. Statistically significant clinician factors predicting success were: higher number of prior cannulation procedures performed, and increased clinician perception of the likelihood of a successful insertion. When patient and clinician factors were combined in a logistic regression model, emaciated versus normal, visible vein/s, ACF versus forearm site, higher number of prior PIVC procedures performed and increased clinician perceived likelihood of success were statistically associated with first-time insertion success.Conclusion: PIVC insertion success could be improved if performed by clinicians with greater procedural experience and increased perception of the likelihood of success. 5. Takashima M, Ray-Barruel G, Keogh S, Rickard CM. Randomised controlled trials in peripheral vascular access catheters: a scoping review. Vascular Access. November 2015: 1(2); 10-37. Randomised controlled trials (RCTs) are the "gold standard" for evaluating effectiveness of interventions, as they provide the most reliable evidence with minimal bias compared to other study designs. However, if the number and quality of RCTs are poor, studies may give inconsistent results and small effect sizes, creating difficulties in generalising the findings to a broader population. This scoping review investigated the current evidence for the insertion and management of peripheral vascular devices, including intravenous, midline, and arterial catheters. We searched Pubmed, Cochrane Central Register of Controlled Trials, and CINAHL between 1 January 2005 and 30 June 2015. The final review included 128 RCTs (94 peripheral intravenous catheters, 2 midline catheters, and 32 arterial catheters). Catheter insertion strategies and analgesia methods have been comprehensively studied, particularly for peripheral intravenous catheters, but more RCTs are needed to address post-insertion care and maintenance, including dressings and securement, flushing practices and infection prevention strategies such as skin preparation and hub decontamination. This peripheral vascular catheter scoping review will enable clinicians and researchers to identify the gaps in evidence and prioritise areas needing further research. 6. Evans O, Gowardman J, Rabbolini D, McGrail M, Rickard CM. In situ diagnostic methods for catheter related bloodstream infection in burns patients: A pilot study. 2016 Jan 5. pii: S0305-4179(15)00203-X. doi: 10.1016/j.burns.2015.07.004. Aims: To assess the sensitivity, specificity and accuracy of two in situ diagnostic methods for CR-BSI in an adult ICU burns population: Differential Time to Positivity (DTP) and Semi-Quantitative Superficial Cultures (SQSC). Conclusion:Both DTP and SQSC displayed high specificity, NPV and accuracy in a population of adult burns patients. These features may make these tests useful for ruling out CR-BSI in this patient group. This study was limited by a low number of events and further research is required. Summary: The findings of our study will provide new evidence to improve insertion success rates in the ED setting and identify strategies to reduce premature device failure for patients admitted to hospital wards. Results will unravel a complexity of factors that contribute to unsuccessful PIVC attempts such as patient and clinician factors along with the products, technologies and infusates used.